And that’s when she discovers a fresh start for real conversations, fewer distractions, and living in the moment, even if the moments are heartbreakingly difficult. Babies are born; marriages teeter; friendships are tested. Evie may find love and a new direction when she least expects it, but she also learns that just because you unplug your phone doesn’t mean you can also unplug from life. I struggled getting into this one. I was intrigued by the synopsis, because I have an ever increasing awareness of society’s rather toxic relationship with the smartphone. The first few chapters though, were more about protagonist, Evie, whining about her lack of a husband. She has a great, all-consuming career (one that she has, nonetheless pigeonholed herself into) and a bright future, but here she is— a modern woman— lamenting about the fact that she’s nearly past her prime and might be relationship-less forever. This kind of put me off, because I’m more of a Bossypants, Bad Feminist, and The Awakening kind of girl. But I trudged on through the novel, and I did find some strong points. The fact that Evie realizes her issue with technology, and subsequently, the world’s issue with technology is timely and a topic that warrants active and passionate discussion. 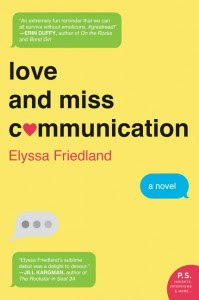 Thankfully, Love and Miss Communication addresses the issue of our addiction to technology and what it’s doing to our socialization skills quite well. Not only is Evie’s life changed, but her self-imposed detachment from technology also affects the lives of those around her— a ripple effect if you will. This exploration of how technology has shaped society is thoughtful and engaging, and I was thankful for it amidst the musings of an otherwise uninteresting, protagonist. She was uninteresting not because she was underdeveloped, but because she was a little too cliche— the upper-middle-class girl that wants it all but can’t seem to find whatever “it” is. As for the positives— the book is well written, and the subject matter of technology and society makes for a necessary and once again, timely, story. Elyssa Friedland attended Yale University, where she served as managing editor of the Yale Daily News. She is a graduate of Columbia Law School and subsequently worked as an associate at a major firm. Prior to law school, Elyssa wrote for several publications, including Modern Bride, New York magazine, Columbia Journalism Review, CBS MarketWatch.com, Yale Alumni Magazine, and Your Prom. She grew up in New Jersey and currently lives in New York City with her husband and three young children. Find out more about Elyssa at her website, and connect with her on Twitter and Facebook.